Suarez is admired for his excellent type and energetic gaits. The trot is big, energetic and tactful and his canter is powerful and uphill. Suarez drew everybody’s attention during his successful completion of the 35- days performance test in Danish Warmblood where he was placed third with a score of 837,50 points. Suarez was stationed at Gränsbo Stuteri during the last season 2018 and was the most used dressage stallion in Sweden. With the triple world champion, Sezuan, as his sire, Suarez’s breeding potential speaks for itself. The mother Damandala is out of a very successful dam line. She is the full sister to Desperada, who is the dam of the licensed stallion Glock's Toto Jr., who won the Pavo Cup both 2015 and 2016. He had nine sons from his first crop qualified for KWPN licensing in Den Bosch 2018 and five of them were licensed. Damandala is also the full sister to the premium stallion Decurio and half sister to the state premium mare Sinphonie. 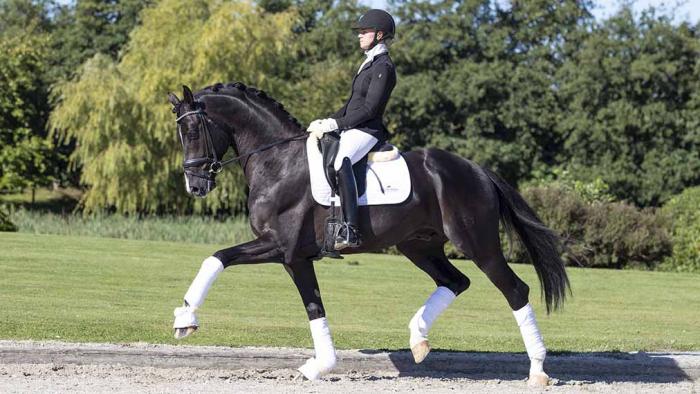 The grand sire, Desperados, with whom Kristina Bröring- Sprehe has been extremely successful on in the international dressage scene, where they won team gold and individual bronze during the 2016 Olympics in Rio. The stallion Rotspon can be found in the third generation of this pedigree. Rotspon has brought a large number of Grand Prix horses and many approved stallions, including Rosevelt, Rascalino and Royal Blend. Suarez is licensed in DWB, HANN, OLD and SWB. Suarez is stationed at Helgstrand Dressage.